I feel like there is this unspoken pact between all film reviewers that its not okay to enjoy junk food. It’s understandable though, Rampage is a very flawed movie if you’re looking at it through a purely critical lens. Rife with nit picks and hardly a plot to be seen, it’s exactly the kind of movie that I sometimes relish the opportunity to just leave my brain at the door, and enjoy the ride as much as the people involved with it obviously are. Very loosely based on the video game by the same name. 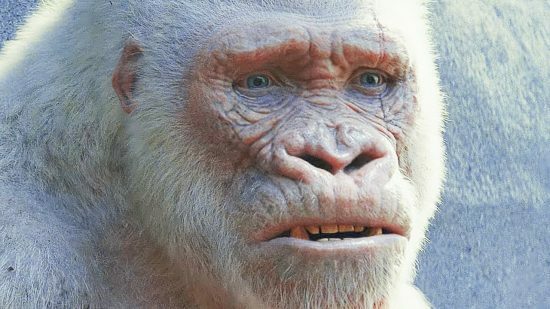 Rampage follows primatologist, ex-marine, huge dude and most charismatic person who claims to hate other people Dwayne Johnson who works closely with the apes in a San Diago wildlife preserve, namely an albino gorilla called George of almost human intelligence. During a blundered science experiment, the subject of a highly dangerous growth hormone breaks loose on a space station and destroys everything in an opening scene that feels like it was ripped from another, very different movie. While not much is left of the station, a bunch of canisters of the chemical fall to earth, infecting George, a Wolf who the Youtubers call Ralph and an unnamed alligator. From there, the “plot” gets a little hazy. Naomie Harris shows up as a discredited biologist who wants to help cure the infected animals while trying to expose the corrupt company that created them, In reality though, she is the device that drives the plot forward. 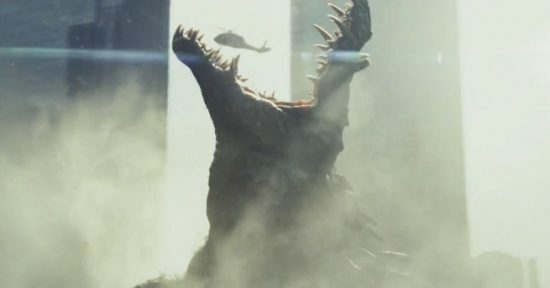 Then Jeffrey Dean Morgan shows up as “ill-defined government person” and drags Dwayne Johnson and Naomie Harris along with him as though taking down the giant monsters were their responsibility. Some other things happen and then we get a shot of The Rock with a grenade launcher and George squaring off against the wolf and the alligator. The plot in this movie is completely secondary to the destruction and visual effects going on throughout. The only purpose the characters serve is to spout some dialogue to justify a scene transition, or knock out a few witty one liners. It’s a spectacle movie through and through, if it’s not the huge CG animals beating crap out of things, then it’s the leads being incredibly charming and likeable. It’s a good thing too, because this movie could have, very easily, been hugely dull for good portions of its runtime had it had a weaker leading cast. Dwayne Johnson is a fountain of effortless charisma, as he always is, able to legitimise any ridiculous movie he finds himself in, made even better by the inclusion of Jeffrey Dean Morgan. This is the kind of movie where Dwayne Johnson gets shot in the stomach half way through, and by the next scene he is fine, having received no medial attention whatsoever. He just tenses his abs and forces the wound closed I guess. It’s not like it’s a plot hole though, because whenever he get’s the opportunity, he raises his hand to the small red stain on his shirt and grimaces ever so slightly. The movie knows exactly what its doing. But it still never gets mentioned again. The human villains are so ineffectual too. Nobody cares about them, they too are just plot devices that happen around the periphery of the main draw. Malin Åkerman and Jake Lacy play the sister/brother duo who run the company responsible for the growth hormone. Åkerman is the ice cold, emotionless brains behind their plan while Lacy is the dimwitted younger brother whose desk is littered with Lego and is seen eating messy foods every time he shows up. They feel like they’ve been pulled out of an entirely different movie, like one of the Spy Kids movies or a Home Alone sequel. They’re never really genuinely threatening and their mugging to the camera is still pretty entertaining. Nowhere near as entertaining as the ways they both exit the movie though, which are probably their highlights. They’re pretty special, the kind of special this movie seems to do well. Ramage is just one more movie in a long line of equally dumb action flicks that aren’t out there to break new ground or win awards, they just want to have some fun while making it and give their audiences that same amount of fun. I really appreciate this type of movie all the more as I see more movies, even if they might be objectively terrible. 2015’s San Andreas falls into the same category, a movie that Johnson also starred in. It’s not just movies with The Rock in through. Gerard Butler pretty much drags London has Fallen along using his unhinged charm. A lot has to be said about leads who don’t take themselves too seriously legitimising the movies they appear in. Johnson had a huge impact on the reinvention of the Fast & the Furious franchise once he joined\hijacked it. Independence Day wouldn’t have been anything near the success it was without Will Smith (or Jeff Goldblum) as top billing, and can you imagine anyone caring about Con Air if Nic Cage wasn’t the lead. Without a strong and charismatic lead, your self aware action flick is suddenly a weak and uninteresting cash grab. It goes to show what a hugely bankable star Dwayne Johnson is right now, the guy can turn anything into a marketable success. 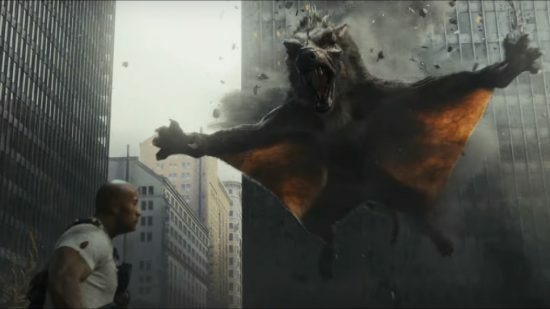 Rampage could have very easily been a terrible movie. Its plot is paper thin, it is tonally inconsistent, it has been criticised for the fetishisation of cities getting destroyed. But I still enjoyed it. It really is the kind of movie you know whether you’re going to enjoy before you even walk into the cinema. Ramage is good, honest, stupid fun. 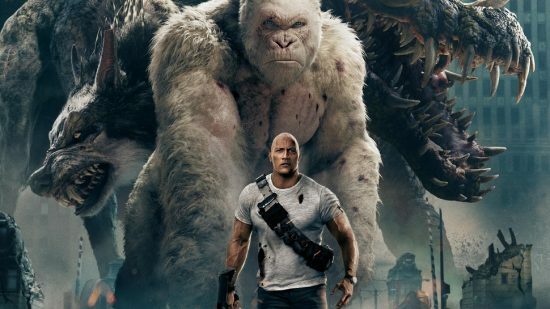 A combination of charming leads, unique and interesting action and a giant white gorilla who flips the bird at people. Posted on April 20, 2018 by WooderonPosted in Movies, My Thoughts on:Tagged arcade, dwayne johnson, george, jeffry dean morgan, lizzie, midway, movie, ralph, rampage, the rock, video game movie. I was kind of hoping they would sequel bait at the end and we’d see the name tag “Larry” on that rat’s cage and see him start to grow. I wouldn’t be against another of these, although I don’t see it happening. Apparently it is making a tonne of money, because The Rock + things blowing up is always a winner, so there *could* be a sequel. It is starting to look like this is the best videogame movie.